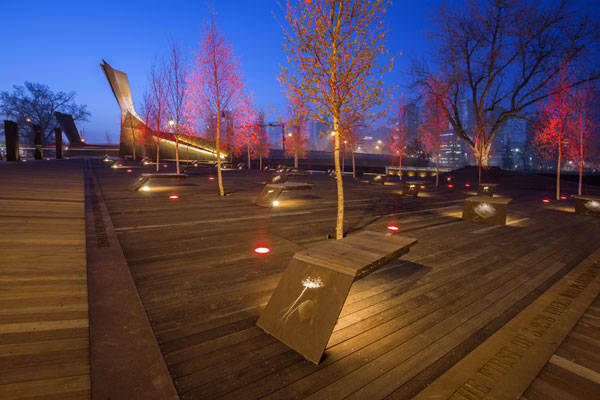 Poppy Plaza by Marc Boutin Architectural Collaborative and Stantec Consulting, Calgary, Alberta, Canada Like many landscapes, Poppy Plaza in Calgary, Alberta, Canada, is situated in an area that provides many opportunities we need to identify and take advantage of as designers. 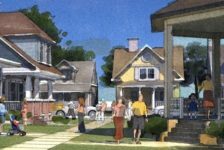 The inherent value in natural systems, existing development, and human use create a set of parameters that distinguishes one site from another. The way we use this information to create a thorough design that serves the needs of potential users can lead to compelling projects that make a statement. One important aspect of our communities is the connections they create. 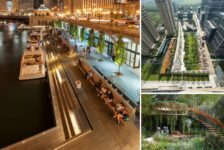 Poppy Plaza uses design to bridge old connections and create new ones. We will explore the connections Poppy Plaza makes in relation to the Landscape of Memory and surrounding areas. Poppy Plaza is part of a $3.5 million redevelopment project along Memorial Drive known as the Landscape of Memory. The goal of the Landscape of Memory is to commemorate Canada’s contribution to World War I and II and other peace-keeping efforts. The road serves as a living memorial to the community. 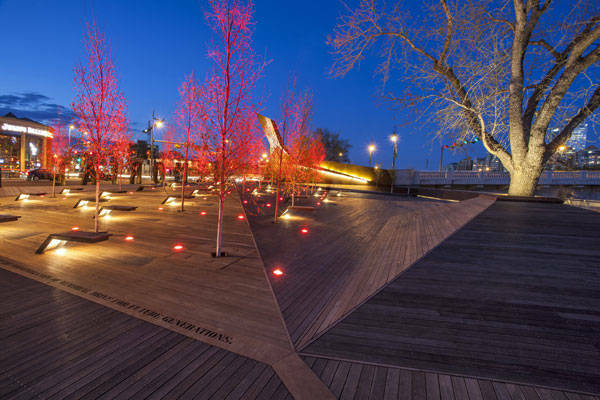 Designed by Marc Boutin Architectural Collaborative and Stantec Consulting, Poppy Plaza took an unused open space at the intersection of Memorial Drive and 10th Street NW and transformed it into an exciting public space. Living Trees within Poppy Plaza Starting in 1922, an effort to plant a tree for every fallen soldier began, with the hope of providing solace to grieving families that did not have a grave to visit. 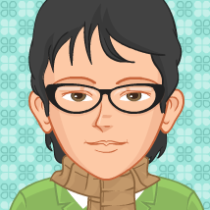 Up until 1928, a total of 3,278 trees were planted, the majority being Poplars (Populus wobbstii). Today, most of these trees are nearing the end of their life cycle, which is in part the reason for the revitalization. In Poppy Plaza, a bosque of new trees was planted to continue the legacy of this tradition. 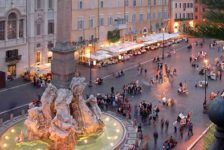 They add a special interest to the plaza and are accentuated by the lighting design. Using landscape as a memorial can be a powerful experience. We are so small compared to the rest of the world, and realizing this can evoke a sense of reflection. Large letters spell out “MEMORIAL” along Memorial Drive NW. These steel letters are slotted so that when you drive or walk by the site, some of the letters appear solid, while others are transparent. They have a profound presence, and blatantly spell out what the park is about. 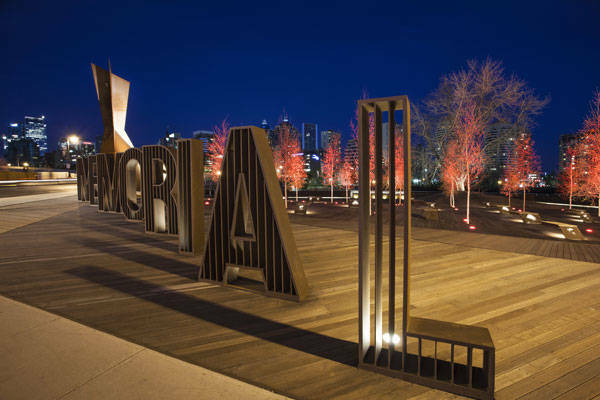 Large steel sculptures are also found at every corner of the park, emphasizing the entrance points to provide a sense of place for the plaza, creating its own identity and connecting it to the other steel elements in the design. Creating and Maintaining Connections at Poppy Plaza The most prominent new connection Poppy Plaza creates is to the adjacent Bow River. The river was not accessible from this area before this project. To solve this, the design navigates the grade change between road level and the bank of the river through steps and ramps. 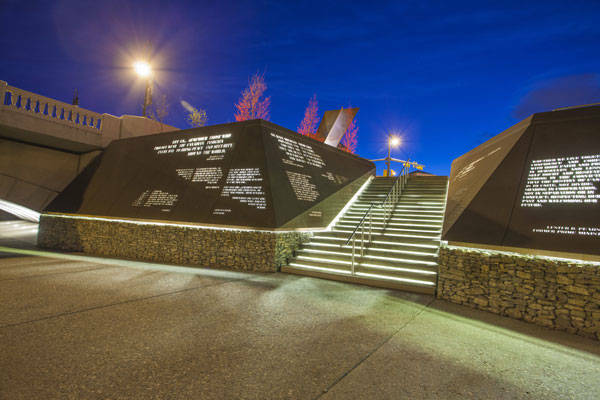 Cor-Ten steel memorial walls provide inscriptions of poem and speech excerpts that invite users to pause and contemplate the sacrifice of war. 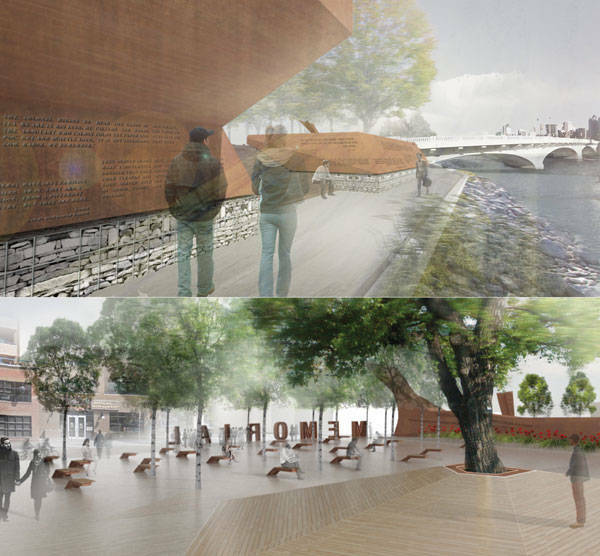 They also function to stabilize the bank of the river and provide a sense of place. Once you arrive at the edge of the river, there is a pathway that runs parallel to the water with views of downtown Calgary across the river. This landscape draws upon the emotive qualities of the river to generate feelings of contemplation and remembrance. Cyclists, joggers, walkers and skateboarders utilize Poppy Plaza and the surrounding areas. 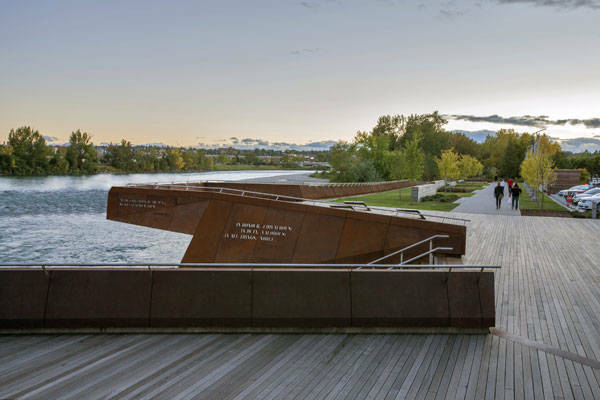 The pedestrian river walk that is part of this project is connected to a larger system that parallels the Bow River on both sides, connecting people to nature in an urban landscape. 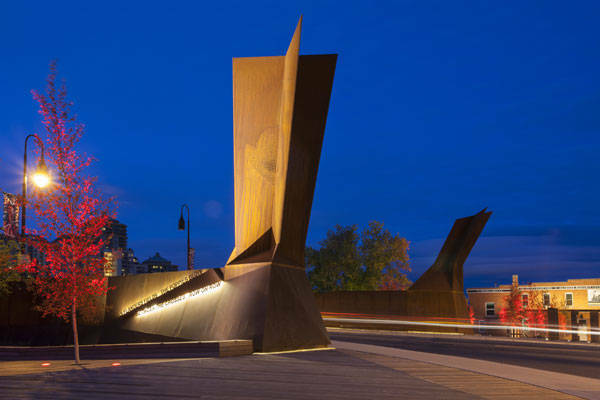 People from downtown Calgary can easily access Poppy Plaza using the Peace Bridge, which is just a few minutes walk from the site. 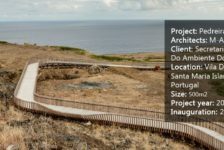 Once they get to Poppy Plaza, the steel components and wooden deck design invite users of the pathway to enter the space. From here, they can experience the plaza and connect to the Kensington Commercial District on the other side of Memorial Drive. 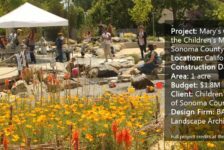 There are a lot of elements in the design of Poppy Plaza that add interest to the space and allow for a unique experience every time you visit. 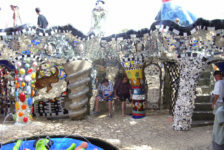 It is such a successful project because it connects to the surrounding community in a variety of ways to create an engaging memorial. 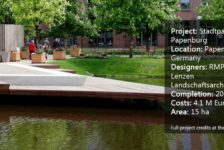 We need to be aware of the context of sites as designers in order to respond to the various issues and opportunities in final designs. The big question is how do we identify the context and bridge these connections? Poppy Plaza does this in a unique way that fits into the context of Memorial Drive while adding value to it.